The resignations came just hours after the firm's controversial chief executive Mr Musk smoked marijuana live on the web during a podcast with comedian Joe Rogan. Shares fell over 10% in early US trade. They eventually ended the day over 6% lower. Accounting officer Dave Morton's resignation was announced in an official filing with US regulator the Securities and Exchange Commission. He said his decision to quit was due to the higher-than-expected "level of public attention placed on the company, as well as the pace within the company." He also tweeted that he might suffer from bipolar disorder but then said "maybe not medically". In August he told the New York Times that he worked "120-hour weeks" and took sedatives. 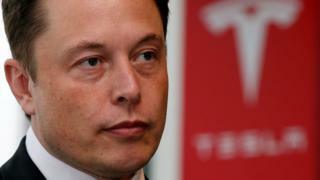 His brother Kimbal Musk told the newspaper that the reason Mr Musk "seems to attract drama" is because he is "so transparent, so open, in a way that can come back to bite him". "We think this is further evidence that the time is now for management and the board to address these issues," he added.